James Bond’s suits often have elements that subtly set them apart from the average high street offerings. While many brands have jumped on the bandwagon of working cuffs to fool people into thinking a suit is better-made, there are many more details that are less common. Here are seven things to consider if you want a suit to help you stand out from the herd in a Bondian way. Peaked lapels—also known as double-breasted lapels—on a single-breasted jacket has been a trendy style for the past decade and is not so difficult to find, but nevertheless it is still not a standard detail. This style has been around since the early days of the modern suit, but it has periodically gone in and out of fashion. 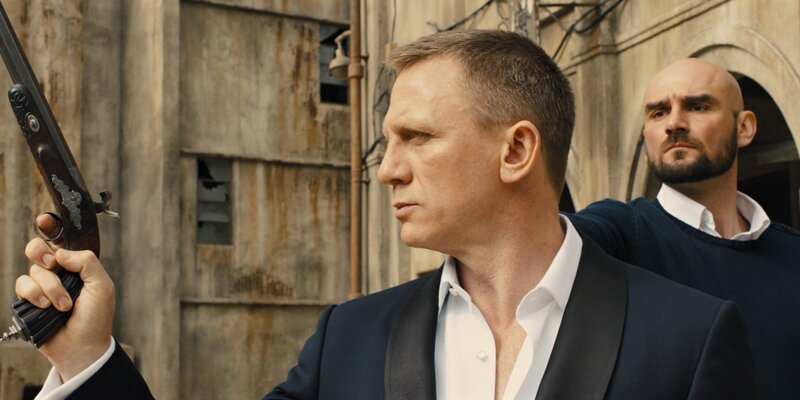 It is currently in fashion, and James Bond most recently wears it in Spectre on a black herringbone three-piece suit to blend in amongst the flashy gangsters, but he wears a casual single-breasted peaked lapel light grey linen suit in Casino Royale comfortably as himself while travelling to the Bahamas. The style is flashier than what James Bond usually wears, but it is still a Bond style. The single-button suit was popular in the 1960s and has seen a small resurgence in popularity in the past decade because it is helps the trendy short jackets look more proportionate, but it hasn’t hit mainstream popularity. Despite a few shops selling button one suits, it’s still primarily a custom style, making it unusual and special. Some Savile Row houses like H. Huntsman, Richard Anderson and Kilgour are known for their single-button house style. James Bond has worn suits in this style in You Only Live Twice and The World Is Not Enough. We only button one button on our jackets, so why not just have one? 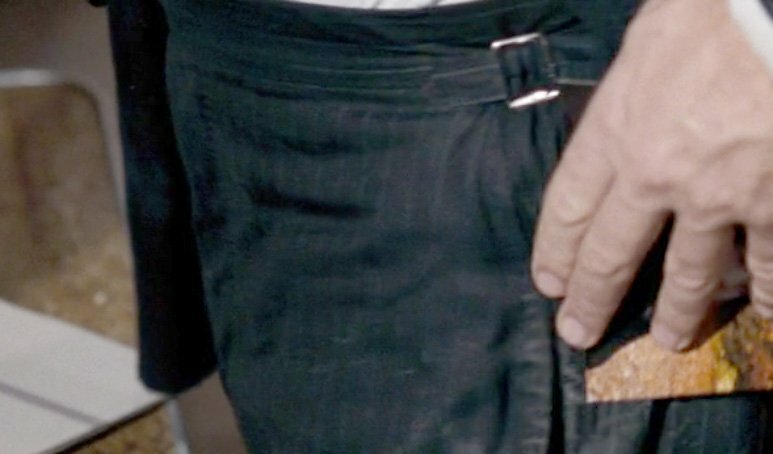 Sean Connery’s and George Lazenby’s suit trousers were always made without belt loops, instead with tabs on the sides to tighten the waist. Roger Moore started out his Bond tenure wearing suit trousers with side-adjusters and Daniel Craig brought them back in Quantum of Solace. The majority of men think that a suit is incomplete without a belt, so most shops sell suits with belt loops. But men who prefer a more streamlined look prefer side-adjusters. Without a belt, the jacket is able to sit closer to the body and the jacket and trousers of a suit are better connected as a single garment without the disruption of a belt. A few English and English-inspired brands sell suits with side-adjusters, but they’re mostly a custom detail that can make a suit special in a subtle but significant way. 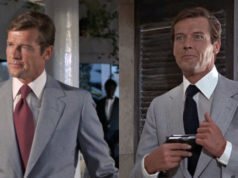 From Sean Connery’s Anthony Sinclair suits to Daniel Craig’s Tom Ford suits, there is a little bump at the top of the sleeve called a roped sleeve head. This detail is not to everyone’s taste, but when done subtly it can add a regal flare to a jacket. This detail is never to be found on an inexpensive suit since it requires extra effort to craft. Natural shoulders are more popular today—particularly amongst the iGent crowd—for their more relaxed look, but that’s not Bond’s look. Typically, roped sleeve heads come at the end of a healthy layer of shoulder padding, but some bespoke tailors, like Douglas Hayward did, make them along with a soft shoulder. Working buttons on one’s cuff are no longer a special detail, since many of the cheapest suits now come with what many used to consider a bespoke detail. What still is a bespoke detail is the gauntlet cuff, a turn-back detail at the end of a sleeve. James Bond wears them on his dinner jackets in Dr. No, The Man with the Golden Gun and Quantum of Solace. Beyond bespoke, Tom Ford may be the only brand to offer them ready-to-wear. They most likely never took off in the ready-to-wear market since they make a sleeve more difficult to alter, though recently that has not stopped brands from making sleeves with working buttonholes. 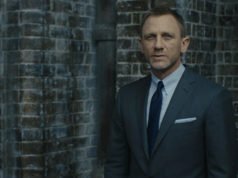 Though James Bond only wears gauntlet cuffs on his dinner jackets, they’re perfectly acceptable on suits and sports coats too. It was on those garments that James Bond’s creator Ian Fleming enjoyed wearing his gauntlet cuffs. Fancy cuffs aren’t limited to gauntlet cuffs. Roger Moore’s sleeves in Live and Let Die and The Man with the Golden Gun flare out at the end and are fastened in a kissing style with a link button. An open vent without any button is another option seen on occasion, but never on Bond. Even just the number of buttons on the sleeve can be varied for some fun. The number of cuff buttons need not be limited to the traditional three or four. Tom Ford has popularised five buttons on his cuffs, while one or two buttons on the cuffs was popular in the 1960s. Three piece suits are uncommon enough, but there are ways to make a three-piece suit even more special. 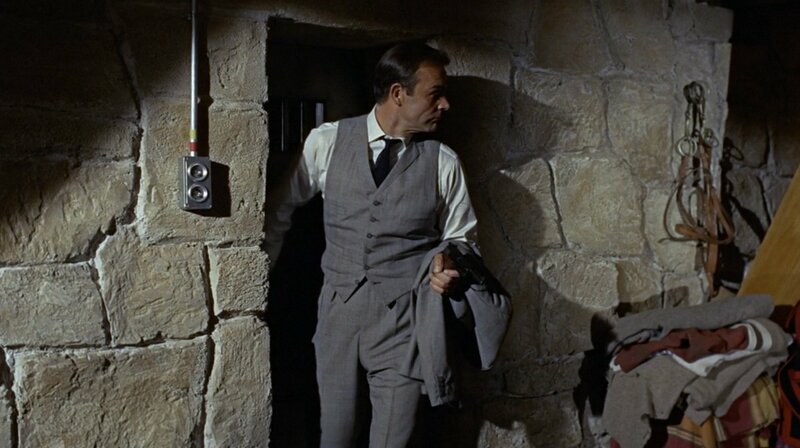 Sean Connery’s famous three-piece glen check suit in Goldfinger goes beyond the standard three-piece suit by putting notched lapels on the waistcoat. Lapels are more of a standard for evening waistcoats and double-breasted waistcoats—which are also more unique than the ubiquitous five- or six-button single-breasted waistcoat—but they can make any ordinary suit subtly more interesting. Waistcoat lapels returned to the Bond series decades after Goldfinger in The World Is Not Enough. Cloth-covered buttons on suits are a bespoke and mod detail rarely seen today. Covered buttons are typically saved for formal wear, such as dinner jackets and morning coats, but they’re acceptable on suits as well. 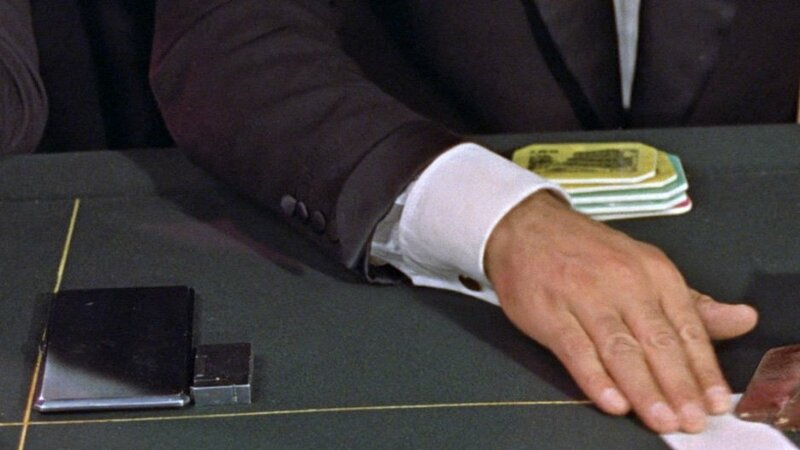 Sean Connery’s blue herringbone flannel suit in Goldfinger has covered buttons, just for a little fun. It’s an elegant detail that you probably never even noticed. 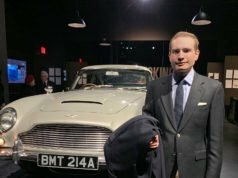 There are some other ways that James Bond has set his suits apart from the typical suit that aren’t quite as unusual, like a button two, show one style (also known as the three-roll-two), hacking pockets, ticket pockets and darts on the front of his trousers (not so much a style but a method to improve the fit). There are many ways to have fun with a suit without wearing trendy poor fits or loud fabrics. Comment below with your favourite unusual suit details. Great article, but I am still wondering why you didn’t put the handmade lapel buttonhole -or milanaise if you prefer. I also like the elegance of buttons made of a beautiful fabric. Contrasting a bit with the trousers, blending in with the jacket. Connery’s daks tops buttons in mother of pearl (? I guess) always did impress me ! Although I am not sure it’s a regular detail on his daytime lounge suits. It appears sometime. 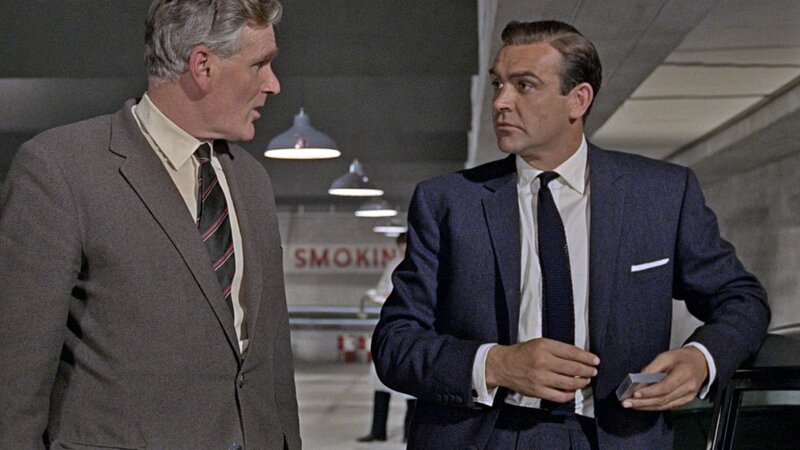 I think they are MOP on the 3-piece flannel suit in Thunderball. I wanted to focus on stylistic details rather than on quality of make. I believe the adjuster buttons on his formalwear were usually white MOP, while the buttons on his lounge suits were smoked MOP. The smoked MOP would be less easily spotted on his primarily dark trousers. Sean Connery’s Air Force blue suit in DAF had peaked lapels. That suit looks like what is very fashionable today, both with the lighter blue colour and the peaked lapels. Pity the suit wasn’t used more in the film. I always try to have either lapels or a straight cut bottom, or sometimes both, on my waistcoats just to make them a bit different. I’m saving up for the charcoal flannel suit from Oliver Wicks and I’m toying with the idea of asking if they’ll make me the gauntlet cuff. It’s a look I quite like. Combining (most) of these details would make a pretty special suit indeed. Starting with a soft shoulder finished with roped sleeve heads. At the end of each cuff, there would be fabric covered buttons fasted in a link button cuff style and the jacket would be made with a single button front with some mid-rise trousers that are tightened with side-adjusters. Other details that could be included would be the flapped breast pocket, which you made an excellent article out of, or even a jetted breast pocket like Tom Cruise’s grey suit in Collateral. I am partial to wearing pocket squares, so I didn’t include such a detail but it could work for a sportier jacket. I wonder, did Moore’s ivory double breasted dinner jacket from Golden Gun have gauntlet cuffs as well as link button cuffs? I mean gauntlets are already too busy for a double breasted jacket but adding links would be too much, don’t you think? Moore’s ivory double-breasted dinner jacket has only gauntlet cuffs, no link button. There’s nothing wrong with gauntlet cuffs on a double-breasted jacket, and Ian Fleming was a fan! And what about wearing cocktail cuffs with gauntlet cuffs on a suit? Do you think it’s still safe or already over the top? I’m not so much a fan of pairing cocktail cuffs with gauntlet cuffs, though it doesn’t bother me so much either. I think gauntlet cuffs ideally need a shirt with double cuffs so the shapes aren’t being repeated. When do the special details go overboard? I think you could have all 7 of the details mentioned in this article on one suit and it would be fine since none of the details compete with each other. It goes overboard when you’re wearing too many loud patterns or jewellery. Speaking of details, I noticed peter sellers in the pink panther wore a suit with a belted back. When should something like this be worn? This is for sporty suits and jacket. Are you going to be doing any of Daniel Craig’s clothes in Logan Lucky? I haven’t seen it. Does he wear tailored clothes in it? 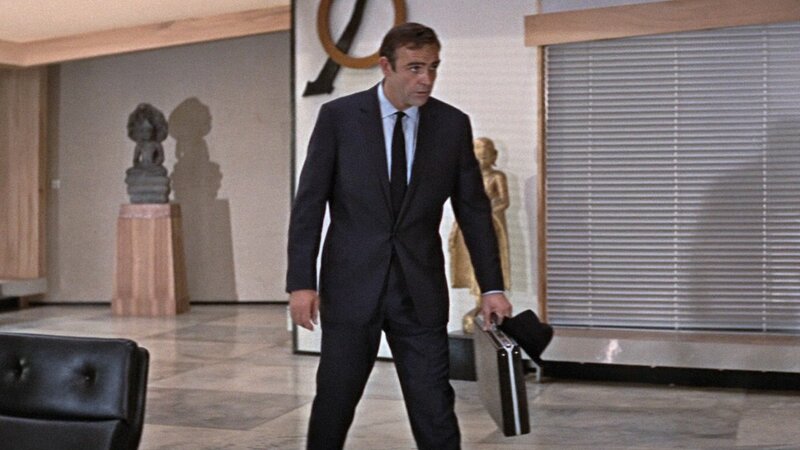 Please Matt, and chance you could do a (00)7 Essential James Bond Odd Trousers to Own? That’s something I’m working on! Very intresting and accurate job, as always. Have you ever thought on an infographic about shirts cut in the Bond series? I’m working on a graphic about shirts. The turnback cuffs associated to the covered buttons make a style too neo Edwardian for my taste, slightly affected. I think turnback cuffs look also great on almost any kind of man’s overcoat, casual or formal (polo coat, chesterfield, balmacaan, etc…). The other remaining details are fine. It’s not really a detail but I really like a ventless back suit jacket. With straight jetted pockets it’s even better ! Sober and simple. Maybe it’s seen as a typical Italian feature nowadays8, but it was very common back in the mid-30s to late 40s, in the USA as well in Europe. I managed to come across this. A cutaway lounge suit? Is their any validity to this or just a gimmick? It’s just a design gimmick. The foreparts of a coat can be cut away different amounts, but there needs to be balance. This looks unbalanced. I know people on menswear forums go on and on about the “quarters” not being cut away enough on most suits, but that’s fairly ridiculous looking to me.